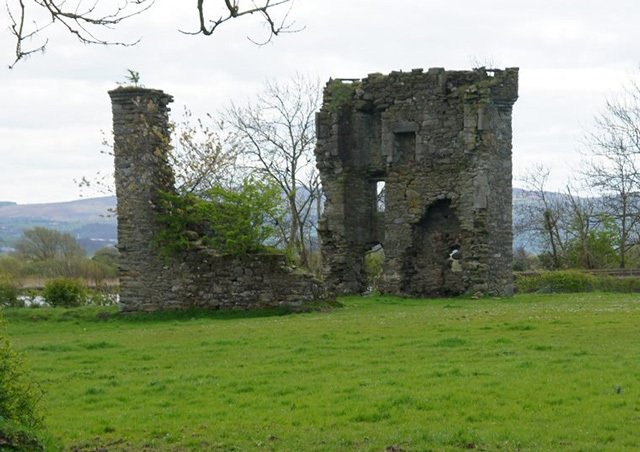 Notes: Mongavlin Castle also known as Mongevlin Castle is a ruined castle on the west bank of the River Foyle, approx 3 km south of St Johnston, County Donegal, Ireland. It was once a stronghold of the O'Donnell's, Lords of Tyrconnell. In the sixteenth century Mongevlin was the chief residence of Ineen Dubh, she was the daughter of James MacDonald, 6th of Dunnyveg, and mother of Red Hugh O'Donnell. The State Paper recording her possession of the castle: " From Cul-Mac-Tryan runs a bogg three myles in length to the side of Lough Foyle in the midst of the bog is a standing loughe called Bunaber here at Bunaber dwells O'Donnell's mother (Ineen Dubh M'Donnell). Three miles above Cargan stands a fort called McGevyvelin (Mongivlin) upon the river of Lough Foyle O'Donnell's mother's chief house." When Ineen Dubh came to Ireland to marry Aodh mac Maghnusa O Domhnaill (Anglicized: Sir Hugh O'Donnell), she brought a force of 100 of the biggest men she could find in Scotland. These soldiers were her bodyguards, 80 of these were of the name Crawford. When the O'Donnell's eventually abandoned Mongavlin the Crawford's settled and married in the locality. Many of their descendants can still be found in the area to this day. In April 1608 following the Flight of the Earls (14 September 1607), Sir Cahir O'Doherty the last Gaelic Lord of Inishowen and rebel leader lays siege to the City of Derry. He had been angered that his lands had been confiscated for the plantation of Ulster. While Sir Cahir was trying to capture Derry he sent Sir Niall Garve O'Donnell to Lifford castle to repel any attempt by the English to send reinforcements to Derry by the river crossing at Lifford. Niall Garve being greedy wanted to be close to the action and have a chance of getting a good share of the spoils when Derry would be sacked. He instead of going to Lifford went to Mongavlin Castle and evicted Ineen Dubh. Here he began plundering the local area and on hearing the news of Niall Garve's actions, Sir Cahir in turn evicted Niall Garve and reinstated Ineen Dubh in Mongavlin. Sir Cahir eventually sacks and burns Derry killing the Governor, Sir George Paulet in the process. Shortly after this the castle was abandoned due to the in-fighting of the O'Donnell clan. The castle was recorded by Captain Nicholas Pynnar in his Survey of the Escheated Counties of Ulster in 1619 where he wrote that Sir John Stewart had built a very strong castle at 'Magerlin' with a flanker at each corner. There had been a flag stone over the archway with the inscription 'J.S.-E.S.T.-1619' which went missing in the early eighteenth century. Though the account that the castle had been completed in 1619 is contradicted by a later Survey (in 1622) of the Escheated Counties of Ulster that reads; Sir John Stuart, assignee of the Duke of Lennox 'has built a castle of lime and stone on the banks of the River Foyle 50' x 25' x 3 1/2 stories, slated, with 4 flankers at the top thereof. And an iron door portcullis wise; the principal timber and joists of the floor being oak are laid but not boarded or the partitions made, the iron grates for the windows being within the castle ready to be set up'. There is a pencil drawing showing the castle. Ludovic Stewart, 2nd Duke of Lennox was granted Mongevlin Castle and lands of 1,000 acres by royal patent on 23 July 1610. On the death of Ludovic on February 16, 1624 the title of Duke of Lennox and the castle and lands at Mongavlin passed to his brother Esme (3rd Duke of Lennox). Esmé married Katherine Clifton, 2nd Baroness Clifton in 1609 and they had eleven children. After the death of Esme in August 1624, Katherine then married James Hamilton (2nd Earl of Abercorn) circa 1632. James Hamilton, 6th Earl of Abercorn, and Viscount Strabane erected a plaque in memory of his mother, The Hon. Elizabeth Hamilton in 1704. James II of England visited here on his way to the siege of Derry in 1690. From here he sent a letter proposing surrender, it was rejected. The castle is now in ruins with only a small proportion of it left standing.